Anterior maxilla is one of the most challenging sites for implant placement, as the local anatomy is most frequently compromised. At the same time, the aesthetic demands are quite high. After careful patient selection and treatment planning, the operator will need to master several bone augmentation surgical techniques, as well as surgical and prosthetic manipulation of the soft tissues. 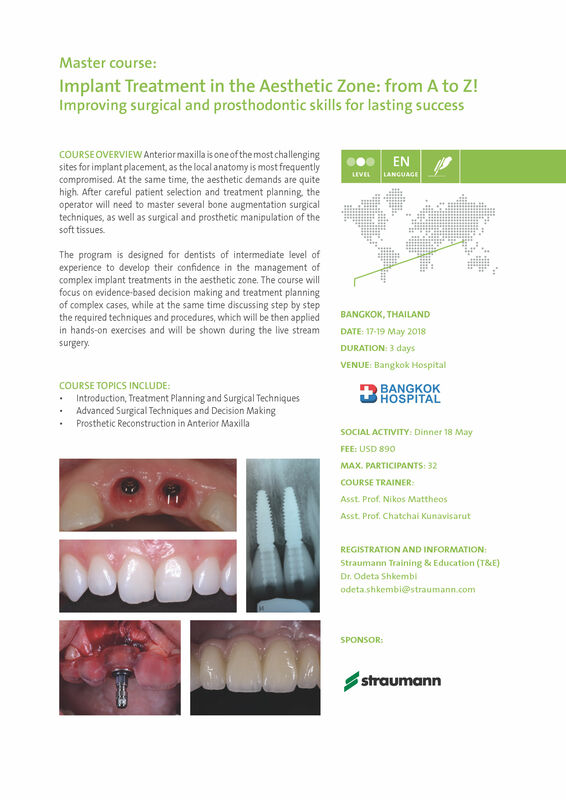 The program is designed for dentists of intermediate level of experience to develop their confidence in the management of complex implant treatments in the aesthetic zone. The course will focus on evidence-based decision making and treatment planning of complex cases, while at the same time discussing step by step the required techniques and procedures, which will be then applied in hands-on exercises and will be shown during the live stream surgery.